The 100th title in the Fortress series, this book describes and examines the F hrerhauptquartiere the 14 or so headquarters built for Hitler. Revealing their locations and how they were used to direct the Nazi war apparatus, this is a fascinating insight into a range of historical sites from Berghof to the Wolf's Lair. 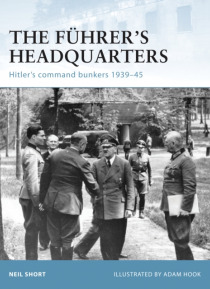 With a map showing the locations of all of Hitler's bunkers and fortification… s on the eastern and western fronts and illustrated with photographs and specially commissioned artwork, this book is an essential introduction to Hitler's command structures and recreates numerous bunkers and buildings which were destroyed by Allied bombing raids or by fleeing German troops.